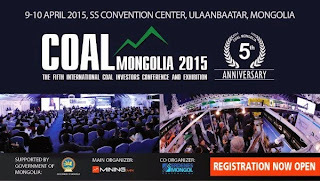 April 7 (gogo.mn) This year's "COAL MONGOLIA-2015" International Conference and Exhibition is celebrating its 5th anniversary and is scheduled for April 9-10, 2015 with the support from the Government of Mongolia with over 600 participants of the decision making level and over 2000 participants to attend the exhibition. Main focus of the coal sector in Mongolia is to produce value added coal products with views to export to the third neighbor and increase the value of the Mongolian coal. 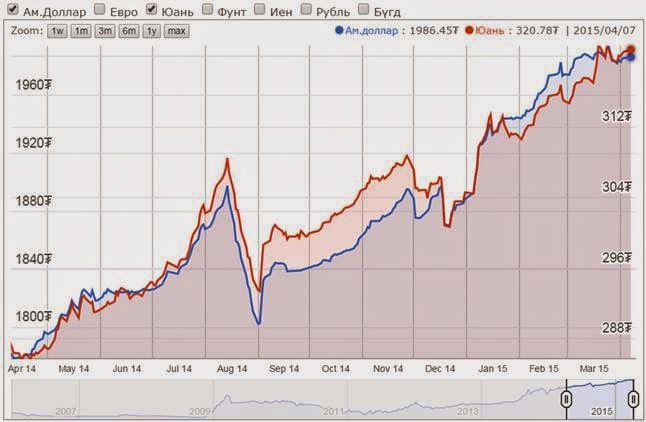 During this period of economic slowdown and decline in coal sector with uncertainty over the Tavantolgoi deal Coal Mongolia 2015 has the significant impact on the further development and direction of the coal market in Mongolia. 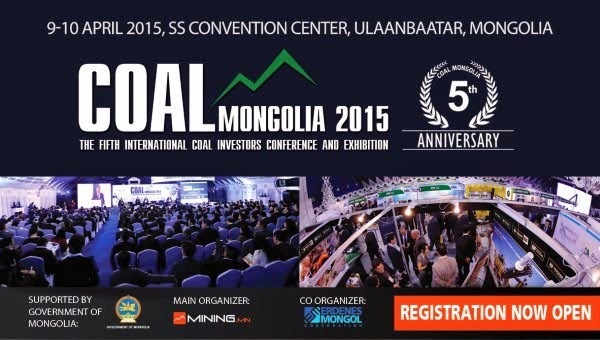 This year's conference program clearly depicts the importance of improving the competitiveness of Mongolian coal at the global market as well as focuses more on attracting investments and financing for the mega projects that are in stagnant mode for over 5 years in the direction of producing energy and gas with further ambition of exporting. Moreover, the conference is to give insight to the sector participants on how long the slowdown in coal market is to continue and how the decline in cycle can be dealt with. April 7 (gogo.mn) "Coal Mongolia" is an International Conference and Exhibition for Coal Investors and it has been expanding rapidly every year. The primary objective of this event is to bring International Investors into the coal sector of Mongolia; to introduce the most advanced, environmentally friendly technologies in coal mining sector; to create a mutually beneficial partnership that will strengthen Mongolia's competitiveness in Asian region. April 7 (UB Post) On April 6, Erdenes Mongol, Tavan Tolgoi, Energy Resources, Erdenes Tavan Tolgoi, and Gashuunsukhait Auto Zam LLC signed a memorandum of cooperation on road use fees for coal transport. In accordance with the memorandum, Tavan Tolgoi, Energy Resources, and Erdenes Tavan Tolgoi that mine at the Tavan Tolgoi deposit will now exclusively transport coal using the paved road from Tavan Tolgoi to Gashuunsukhait for a fee of one dollar per ton of coal. Last month, Deputy Prime Minister U.Khurelsukh conducted a working visit to Umnugovi Province, becoming acquainted with the mining site. He instructed companies and agencies to stop the transport of coal along dirt roads, kicking up dust and putting ruts in the soil. Following his decision, on March 31, the Minister of Roads and Transportation released an order prohibiting the transportation of coal along dirt roads. The mining companies began transporting coal on the paved road starting on April 1, and estimates suggest that 13 million tons of coal will be transported this year. Vice Director of Erdenes Mongol S.Tselmeg said that the company will work at a deficit if they don't fulfill their plans, because 13 billion MNT is required for maintenance of the road. Erdenes Mongol took out a loan of 108 million USD from Development Bank at a 4.25 percent annual interest rate to purchase the paved road from Tavan Tolgoi to Gashuunsukhait. The deadline for repayment is now approaching and Development Bank has said that it is impossible to extend the date, but they have proposed issuing new loan an interest rate from seven to nine percent. S.Tselmeg emphasized that if Development Bank doesn't extend the loan period, the company will face interest rate payment pressures and be unable to make road maintenance payments. Regarding the debate over different road fees being paid by TT mining companies before the signing of the memorandum, S.Tselmeg said that the companies did not pay different fees. Energy Resources built the 245 km road for 118 million USD and Erdenes MGL bought the road for 100 million USD. It was decided that the remaining 18 million USD would be paid for by road use fees. Energy Resources said they paid 0.75 USD per ton for using the road, and the 0.75 USD difference in fees being paid by competitor was being deducted from the road's loan repayment balance. Energy Resources discounted road fees added up to 3 million USD. The agreement with the Footsie giant will fund Petro Matad's share of a mutually agreed US$28mln work programme that will satisfy the minimum work obligations for both blocks under the current licence terms, which apply until July 2017. "BG Group's decision to enter Mongolia is an endorsement of the potential within the acreage and Petro Matad's technical work to date," asserted Dr Oyungerel Janchiv, acting chairman of Petro Matad. "As a result of this transaction Petro Matad will be fully funded in relation to the remaining licence commitments on Blocks IV & V," he added. 10:50am April 7 (Sky News) Rio Tinto CEO Sam Walsh has confirmed expansion of it's $7 billion Oyu Tolgoi gold and copper mine in Mongolia will go ahead. It comes after Mongolia's newly elected Prime Minister, Saikhanbileg Chimed, announced the two sides had met on 'crucial issues'. The expansion plans came to a standstill almost two years ago over a tax dispute and cost over-runs during the first phase of contruction. The move comes as Mongolia's new leader lookes to improve the country's economy and foreign investment. April 7 (UB Post) Prime Minister of Mongolia Ch.Saikhanbileg made a statement to the people of Mongolia on April 5, on Parliament's performance of last three months and introduced planned short-term projects. The new "Government for Solutions" was established three months ago, with the priority to end the economic crisis. Within the last hundred days, the government has completed over 40 large projects, such as state budget cuts, approved a detailed plan to overcome the economic crisis, signed the first free trade agreement with Japan, approved the second phase of the Mongolian Millennium Challenge, established trilateral labor-society dialogue, took measures to increase gold mining, found new sources to finance oil production, reduced expenses of ministries and government agencies, recovered exploration operations, resolved financing issues of a new hospital, increased pensions and welfare amounts, and promoted Mongolia at the world's largest tourism trade fair, ITB Berlin, according to the Prime Minister. Ch.Saikhanbileg called on the nation to create rather than criticize and announced that the government has reached an agreement with Oyu Tolgoi investors on the project's underground mining operation after two years of dispute. He added that the government will make an official announcement on these results to the international community when they are finalized. The second phase of Oyu Tolgoi is expected to bring a 4.2 billion USD investment to Mongolia, according to the Prime Minister. Ch.Saikhanbileg said that negotiations with a foreign consortium to develop the Tavan Tolgoi coal deposit will also be finalized soon. The decision to move forward on Oyu Tolgoi reportedly came after the Prime Minister's controversial text poll to all mobile phones in Mongolia. The majority of the poll's respondents supported increased overseas investment in megaprojects such as the Oyu Tolgoi mine to stimulate the troubled economy, according to Ch.Saikhanbileg. In addition to a status update on big projects, the Premier's address brought up government decrees and objectives of Parliament's spring session, which include plans to issue Tavan Tolgoi shares to the public free of charge, tax reforms and liberalization of energy prices. Ch.Saikhanbileg said that the government will actively cooperate with Parliament and political parties to make political parties healthy, adopt a new law on political parties, make its financing transparent and adopt a new law on elections. According to Ch.Saikhanbileg said that his poll revealed that provincial residents aren't supportive of mining operations in their region. Therefore, the government will submit a law that resolves provincial taxation system. With the new law, 30 percent of royalty payments will be allotted to the province. The Prime Minister promised that Noyon Uul will remain untouched but Gatsuurt gold deposit will be exploited. A construction of paved-roads in Dornod and five western provinces will continue, as well as the construction of a 267 km railway between Tavan Tolgoi and Gashuun Sukhait. The construction of a 570 km railway between Erdenet and Ovoot will start this year. The investment for gasification and liquefaction of coal being resolved, and new cement factories are expected to be commissioned this year, according to Ch.Saikhanbileg. Construction of a gasification plant, which is set to start this year, is expected to intensify the fight against air pollution in Ulaanbaatar. The cabinet has resolved to settle the financing for gas-lines, based on the funding from the easy-term loan being provided by the government of China, according to the Premier. The government will resolve the restructure of the Mongolian Stock Exchange with the London Stock Exchange, reform of MIAT Mongolian Airlines in cooperation with related domestic and foreign entities, and introduce the organization model of Singapore's Temasek Holdings to state-owned companies. Another important concern for the government is the introduction of "Start-Up" program that aims to promote businesses, in particular the export-targeted industries and enterprises, said Prime Minister Ch.Saikhanbileg during his speech. The Ministry of Industry will carry out a special program that will support industries and entities that export. The ministry plans to accumulate one billion USD from foreign trade by promoting wool and cashmere industries, as well as other new industrial initiatives of Mongolia. Ch.Saikhanbileg said he intends to visit financial and investment centers of the world along with representatives of the private sector to build relation, and aim to improve the current economic condition by exploring and inviting investors as much as possible. The cabinet is focusing on the immediate adoption of the draft laws on casinos, establishment of horse racing tracks with betting stations, building exhibit and conference halls to attract investors and tourists. April 7 (ABMN) Turquoise Hill Resources (NYSE:TRQ)'s stock had its "underperform" rating restated by research analysts at CIBC in a report released on Tuesday. Turquoise Hill Resources (NYSE:TRQ) traded down 0.83% during mid-day trading on Tuesday, hitting $3.57. The stock had a trading volume of 2,027,467 shares. Turquoise Hill Resources has a one year low of $2.65 and a one year high of $4.11. The stock's 50-day moving average is $3. and its 200-day moving average is $3.. The company has a market cap of $7.18 billion and a price-to-earnings ratio of 223.12. Turquoise Hill Resources (NYSE:TRQ) last issued its quarterly earnings data on Tuesday, March 24th. The company reported $0.06 earnings per share for the quarter, missing the analysts' consensus estimate of $0.07 by $0.01. The company had revenue of $634.10 million for the quarter, compared to the consensus estimate of $613.00 million. During the same quarter last year, the company posted $0.10 earnings per share. Turquoise Hill Resources's revenue was up 1128.9% compared to the same quarter last year. On average, analysts predict that Turquoise Hill Resources will post $0.16 earnings per share for the current fiscal year. Separately, analysts at TheStreet downgraded shares of Turquoise Hill Resources from a "hold" rating to an "e+" rating in a research note on Thursday, March 26th. Rio Tinto Ltd. buys back A$560 million of shares: Is it time to buy? April 7 (Motley Fool) Australian mining giant Rio Tinto Limited (ASX: RIO) today announced it had successfully undertaken the local component of its $US2 billion capital return programme. Rio, which is dual-listed on the ASX and London Stock Exchange, is to buy $500 million of its Australian shares off market at a discount to the market price of up to 14% – representing a buy-back price of $48.44. Today, Rio also declared it would continue to undertake its larger on-market buy-back of its UK-listed shares until the end of the year, which will amount to approximately $US1.575 billion. The Australian component was heavily oversubscribed, with a 91.02% scale back of tenders. Shareholders who elected to tender their shares for a discount of 13% or less, will not have any shares bought back. Those tendering shares at the maximum 14% discount will have a minimum of 85 shares bought by Rio, before the scale back takes place. However shareholders who have less than 35 shares remaining as a result of the buy-back will have their tender taken-up in full. Rio's buy-back comes at a time when prices of its key commodities are under threat and it says proceeds from the capital management initiative will be credited to Australian bank accounts on 15 April 2015 (provided shareholders have direct credit authority through their share register). Should you buy or sell Rio Tinto shares? Shareholders choosing to sell their shares through the buy-back will receive a per unit price which is less than the current on market price but will be compensated with tax-effective franking credits. The fact the buy-back was so heavily oversubscribed could be a result of investors recognising the bleak industry outlook for all iron ore miners. With the iron ore price down some 63% since the beginning of 2014 and Rio's share price down 16% over the same period, the miner could come under further pressure in the near-term if the iron ore price continues to fall. This morning's unprecendented decision by junior West-Australian iron ore miner, Atlas Iron Limited (ASX: AGO), to suspend its own shares is testament to the fact that iron ore miners are under significant pressure. Rio (its iron ore division accounted for 46% of revenues in 2014) might not go bust given its superior low-cost production profile, but it's certainly not a stock I'd want in my portfolio right now. April 7 -- Guildford Coal Limited (Guildford or the Company) (ASX: GUF) is pleased to announce that in March 2015 the Company has successfully shipped 38,000 tonnes of coal to the Ceke Border station in China from the Baruun Noyon Uul (BNU) coking coal mine in the South Gobi Mongolia. 7,000 tonnes were shipped for Baotou Iron & Steel (Group) Co. Ltd (BAOTOU) and 31,000 tonnes for Jiuquan Iron & Steel (Group) Co Ltd (JISCO). During the month of March, Guildford has delivered a shipment of 20,000 tonnes of clean coal, washed at a Toll washing plant in Ceke, China, to JISCO. March wash plant performance reached 83% yield. The Company has confirmed and commenced shipment of the next 40,000 clean coal tonnes to JISCO, which is part of the previously announced 60,000 tonnes contract, to be completed in March and April 2015. Guildford has successfully transitioned from explorer to miner status, with BNU recommencing production in December 2014. The Company is focused on continuing to build the BNU coking coal brand and locking in long-term contracts with Asian customers. Toronto, Ontario, (FSCwire) - Mongolia Growth Group Ltd. (YAK - TSXV)("MGG" or the "Company") announces that various employees and a consultant have agreed to forfeit and cancel 615,000 options with exercise prices between CDN $4.00 and CDN $4.77. The Company also announces today that a total of 640,000 5-year, stock options to purchase shares of MGG at an exercise price of CDN $0.74 per share have been granted to directors and officers subject to TSX Venture Exchange approval. These options have been issued pursuant to the Company's Stock Option Plan in order to attract, retain and motivate existing directors, officers and employees of the Company. The stock options and shares issuable on exercise thereof will be subject to a hold period of four months and one day from the date of issuance. Ulaanbaatar, April 7 (MONTSAME) At the Stock Exchange trades on Tuesday, a total of 360 thousand and 859 units of 17 JSCs were traded costing MNT 32 billion 631 million 255 thousand and 054.50. "Hermes center" /10 thousand units/, "Olloo" /5,000 units/, "APU" /2,121 units/, "Genco tour bureau" /1,970 units/ and "Khokh gan" /1,533 units/ were the most actively traded in terms of trading volume, in terms of trading value were "APU" (MNT seven million 557 thousand and 940), "Talkh chikher" (MNT seven million 118 thousand and 700), "Tavantolgoi" (MNT one million 319 thousand and 332), "Hermes center" (MNT one million 300 thousand and 040), "Gobi" (MNT 616 thousand and 460). The total market capitalization was set at MNT one trillion 335 billion 078 million 901 thousand and 150. The Index of Top-20 JSCs was 13,434.39, decreasing 0.16% and the all index of MSE was 973.65, decreasing 0.11% against the previous day. April 7 (MSE) On 7 April 2015, 12 weeks Government retail bonds worth MNT33,751,100,000.00 with 15.185% annual interest rate traded successfully on primary market at Mongolian Stock Exchange. April 6 (MSE) Dear investors, please be advised that the following government bond is about to mature. April 7 (MSE) In order to increase capital market participation for residents, the long term government retail bonds will be traded through Mongolian Stock Exchange along with the short term government retail bonds. Coupon payment of long-term government retail bonds will be paid on every 15th of January and 15th of August or 15th of May and 15h of November. April 7 (Bank of Mongolia) On the Foreign Exchange Auction held on April 7th, 2015 the BOM has received bid offers of USD 7.1 million in a rate between MNT 1986.04-1987.51 and CNY 76.0 million in a rate of MNT 320.67-321.00 from local commercial banks. BOM has sold USD 4.6 million in a rate of 1987.00 and CNY 37.7 million with rate of 320.72. On April 7th, 2015, The BOM has received MNT Swap agreement bid offer in equivalent to USD 2.5 and USD Swap agreement bid offer of USD 95.0 million from local commercial banks and accepted the offer. ULAN BATOR, April 7 (Reuters) - Mongolia's parliament has stepped in at the last minute to halt a landmark deal with a consortium of foreign firms to develop the giant Tavan Tolgoi coal mine near the Chinese border, saying it needs the approval of legislators before going ahead. A series of delays at major mining projects such as Tavan Tolgoi and the Oyu Tolgoi copper mine run by Rio Tinto have taken a toll on Mongolia's tiny economy, with foreign investment slipping 74 percent last year. The government asked a consortium consisting of the Mongolian Mining Corp, China's Shenhua Energy and Japan's Sumitomo Corp to invest $4 billion in the project and had hoped to sign off on it this week following four months of negotiations. Prime Minister Chimed Saikhanbileg said in a televised address at the weekend that the talks were in their final stages. However, parliamentary speaker Zandaakhuu Enkhbold said the deal might be in breach of Mongolian law and the government has now agreed that it should be approved by legislators before going ahead. "It seems the prime minister did not keep the speaker apprised of developments," said Badral Munkhdul, chief executive officer of market intelligence group Cover Mongolia. A government spokesman confirmed that representatives of both Shenhua and Sumitomo were in Ulan Bator on Monday to sign the deal, which would see the consortium take over management at Erdenes Tavan Tolgoi, the state-owned entity in charge of the project, and expand capacity. Sumitomo and Shenhua were not immediately available for comment on Tuesday. The much-delayed 1.8 billion tonne coking coal project, located 240 km (150 miles) north of the Chinese border, was regarded as one of the most promising untapped deposits in the world. But commercial activity at the mine has been halted repeatedly as a result of financial constraints. In February, the former chief executive officer of Erdenes Tavan Tolgoi, Yaichil Batsuuri, was jailed on corruption charges. Saikhanbileg took over as prime minister in November after political infighting and a flagging economy resulted in a vote of no-confidence in his predecessor, Norov Altankhuyag. April 7 (gogo.mn) Tavantolgoi Project Leader and State Minister M.Enkhsaikhan received General Manager of Coal Dept. at Sumitomo Corporation, Susumu Ishihara that participated in Investor Consortium. During the meeting, Mr.Susumu Ishihara said "I arrived in UB to participate in signing of TT investment agreement. It has become difficult for me as I haven't been psychologically prepared for the delay of signing. TT project is very important for both Government of Japan and Sumitomo Corporation. During the Mongolian Prime Minister`s visit to Japan in February of this year, CEO of Sumitomo Corporation Mr. K.Nakamura hold meeting with PM Ch.Saikhanbileg specifically and discussed on TT investment. We had assumption that the agreement is to be submitted for the approval by the Government to State Great Khural." Tavantolgoi Project Leader and State Minister M.Enkhsaikhan said: "First of all, I want to express my gratitude on your great effort. Spring session of the Parliament was started, yesterday. Parliament has owned right to finalize the TT investment agreement and the decision is to be made within two weeks. Working group consisted of representatives from the parties. TT investment agreement for 30 years. Therefore, before the agreement is signed, discussing by the Parliament will not be difficult and we see it as a great opportunity." At the end of the meeting, Mr.Susumu Ishihara said: "We hope that either Investor side and Mongolian side will succeed on mutually beneficial basis." April 7 (infomongolia.com) On April 06, 2015, the regular Cabinet meeting of the Government was held, where an expected issue to ratify the Tavan Tolgoi Project was not discussed following a disagree statement given by the Speaker of the State Great Khural (Parliament) Z.Enkhbold in his opening speech of the Spring Plenary Session held same day morning. In 2010, the Parliament of Mongolia authorized the Cabinet members to put into economic circulation the Tavan Tolgoi deposit and due to privileges, the Head of Government, Ch.Saikhanbileg was about to proceed the Project's agreements and contracts at the Cabinet meeting scheduled yesterday. Following talks between the Premier Ch.Saikhanbileg and Speaker Z.Enkhbold, the sides finally agreed to submit the issue to the Parliament spring plenary session and expected to undergo within 14 working days, where both authorities pledge to forward the Tavan Tolgoi Project beneficially to both investors and Government. April 7 (gogo.mn) Today at State House, MPP administration announced its preparation for conducting opinion poll among the public. MPP group decided to take part in spring session of State Great Khural with principles on electoral system. In other words, they will organize public opinion poll on majority and proportional system which is existing currently. They will not use electronic voting machine during the poll. "Because of the General Election Committee, electronic voting machine would not be permitted to conduct a poll. Even, the paper of the machine is purchased from the abroad." Head of MPP, M.Enkhbold said. "Therefore, the poll result will be counted manually by hand. After the poll, we will work for reflecting views of public on electoral system to the law on election." he said. Additionally, MPP considered that the proportional election system is inappropriate for Mongolia. After, the 2012 elections, MPP won 26 seats at the Parliament by party list. Thus, MPP considered that those candidates are announced by political parties and they could not represent the public. April 7 (infomongolia.com) At the regular Cabinet meeting held on April 06, 2015, it was resolved to implement "Apartment Lease" Program for low and middle-income households. The Program is targeted for those who cannot apply or do not meet criteria for 8% mortgage loans and according to this Government decision as well as action plan for 2015-2016, apartment blocks for 1,300 households will be constructed across the country, of which 800 units in Ulaanbaatar and at least 60 flats in each center of 21 Aimags of Mongolia. These blocks will be commissioned under public-private partnership and an average monthly rent is estimated to be 1/4 of average household income for a long term period. Moreover, the Program to create a house renting system between state and public is aimed to reduce air and soil pollution as part of implementations the Housing Mortgage Program under the Government Action Plan for 2012-2016 with state supports to provide residents with comfortable living conditions. Accordingly, Minister of Construction and Urban Development D.Tsogtbaatar is entrusted to administer the "Apartment Lease" Program and Minister of Finance J.Erdenebat to manage financial issues, in particular, to set the relevant expenses in the State Budget for 2016, 2017 and 2018 respectively. April 7 (infomongolia.com) At the Cabinet meeting held on April 06, 2015, Minister of Food and Agriculture R.Burmaa introduced a policy to adhere and further measures to carry out on spring cultivation preparations as well as liabilities arose between mill houses and agricultural enterprises. In 2015 spring cultivation, it plans to seed in 328.6 thousand hectares nationwide, of which 300 thousand ha of wheat, 13.9 thousand ha of potatoes, and 8.3 ha of other vegetables, and estimates to collect 500.2 thousand tons of harvest, of which 465.7 thousand tons of wheat, 167.7 thousand tons of potatoes, and 104.7 thousand tons of other vegetables. Ulaanbaatar, April 7 (MONTSAME) The Cabinet Secretariat for Government appointed Tuesday Mr G.Ganbold as its deputy head. He has replaced by Ch.Sainbileg who got another appointment. Ganbold Galsan began his career from the Central Committee of the former Confederation of Mongolian Revolutionary Youths (CMRY). He has worked as a deputy leader of the Union of Mongolian Students and head of the Union of Mongolian Youths, as first deputy chair of the Cabinet Secretariat and a general-coordinator at the "Golomt" commercial bank. In 1990s, he was elected member of the People's Khural. Since 2012, he has been working as an executive director of the "Golomt" bank. Ulaanbaatar, April 7 (MONTSAME) The cabinet at its meeting this Monday approved draft amendments to the law on budget and on Human Development fund, and resolved to submit them to parliament immediately. These amendments offer an increase in a percentage of income to be accumulated in localities' budgets from the mineral exploration and extraction. The current law on budget regulates that five percent of the royalties goes to the local development funds in frames of implementing the state policy on promoting the localities' development, while the payments of mining licenses directly go to the state budget. The motives for amending the laws derive from the necessary support from the local administrations and people in order to forward the mining operations. If the income from mining for localities would increase by a proper amount, mineral explorations and researches will intensify, thus, a mineral resources exposure will grow, the cabinet considers. Ulaanbaatar, April 7 (MONTSAME) The cabinet on Monday decided that "National Corporation of Civil Aviation" state-run institution is to be established after separating the Authority of Airports and the Authority of Air Navigation from functions of the Civil Aviation Authority (CAA). - The cabinet re-approved a structure and maximum number of staffers of the Administrative Offices of the "Altanbulag", "Zamyn-Uud" and "Tsagaannuur" economic free zones. - The cabinet discussed draft directives the Mongolian side must adhere to during official visit of Turkey's Minister of Foreign Affairs Mevlut Cavuşoglu to Mongolia on April 11-13. The directives will be approved by the PM. - The cabinet discussed outcomes of the official visit of the Speaker Z.Enkhbold to Japan paid on February 23-27 of 2015. An obligation was given to the FM to submit the matter to the National Security Council (NSC). - The Minister of Road and Transportation N.Tomorkhuu spoke about a second Mongolia-China-Russia consultative meeting of Vice Ministers of railway affairs to be held here this April 9-10. The cabinet backed draft directives for the Mongolian side. - N.Tomorkhuu briefed about a working course of the "New Railways" project on constructing base structures of railways at first and second phases, reflected in the state policy on railway transportation. - The Minister of Finance J.Erdenebat presented a draft national report themed "Managing the transmission from Millennium Developmental Goals to Sustainable Developmental Goals". This report will be submitted to the United Nations Economic and Social Council (ECOSOC). - Head of the Cabinet Secretariat of Government S.Bayartsogt presented the 2014 implementation of goals and measures reflected in the National Developmental Strategy (NDS) based on the Millennium Developmental Goals of Mongolia. Obligations were given to the capital city's Mayor and to governors of aimags to intensify the realization of these goals. - The cabinet decided to convey its proposals and conclusion to a draft new wording of the law on social welfare for elders, initiated by N.Nomtoibayar MP. - The Minister of Mining Jigjid reported that requests of 12 companies have been backed on obtaining special licenses of gold exploration, and that official letters on it will be sent to the Bank of Mongolia. April 7 (UB Post) Member of Parliament Ts.Oyungerel visited Baganuur District's central hospital, water treatment plant, and waste disposal facility last week for research for her draft law on waste disposal. The law is expected to be submitted to Parliament in May. "There is a great risk of the sudden outbreak of contagious diseases related to the problems with waste management. Therefore, we have to know where we have buried this waste, how much waste is buried, and how to prevent outbreaks of disease. These have to be regulated by the law," MP Ts.Oyungerel highlighted. The MP also noted that the recent state distribution of land and increased construction due to rapid economic growth might pose hidden dangers related to waste management. "There is a lot of land being distributed and sold, and people build anywhere they like. What if someone digs up this buried waste during construction and sets off an outbreak?" she added. Ts.Oyungerel brought experts, legal advisors and the press along to the visit to Baganuur, 138 km from the nearest Ulaanbaatar district, to assist her in drafting the law and to bring awareness of waste disposal issues to the public. The most pressing waste disposal problems in Baganuur District, with a population of over 27,000 as of January 2013, were discovered at the district's central hospital. According to Baganuur Central Hospital Director Enkhbayar, the hospital has major issues in the disposal of medical waste such as syringes and single use materials used by patients, as well as liquid and solid waste. "We need reconstruction of the water treatment system, because liquid waste coming out of hospitals has to go through a special treatment system before being drained to the central treatment plant, as it might contain hazardous elements," explained Enkhbayar. "This system is located in a special building, but the treatment process stopped because of technical failures seven or eight years ago. There is remaining sludge left in the system because of the failure. The amount is critical and must be addressed swiftly, or it could stop the whole hospital's operations." To resolve the issue, the hospital director proposed cleaning out the entire sewage system and replacing it with a new one, as the old ones pipes are blocked and have never been cleaned before. "Other hospitals have these pipes cleaned once or twice an year, but our hospital has never done this because there are no experts on waste disposal and management here. When there are problems with the sewage pipes, only plumbers are sent down to solve the issue," Enkhbayar said. In response, MP Ts.Oyungerel said, "In the law, we want to state that if an organization houses a sewage tank, they have to know its precise location on a map, clean and sterilize the tanks, and take preventative measures to ensure that no hazardous waste leaks into the environment. Medical waste treatment tanks seem most dangerous to me." "I have visited the Khan-Uul District Hospital and their waste tanks were full and overflowing, and they wanted to bury the tanks as they were. It seems to me that all the dangerous waste is being dumped straight into the environment, which has the potential to cause any number of disease outbreaks," she added. The disposal of used medical supplies, especially from infectious disease wards, are also causing major issues at the hospital. "Most urgently, we need an autoclave to sterilize equipment and supplies with high pressure, saturated steam. We currently use a combustion method to dispose of used medical supplies, which is not consistent with standards because it pollutes the surrounding air. Syringes, needles, cotton balls, gloves and other single-use supplies have to be sterilized by autoclave and then crushed before being disposed of," explained Dr. Gerlee of Baganuur Hospital. The medical staff who met MP Ts.Oyungerel all noted that supplies for disposing of medical waste are insufficient, as the hospital's budget is unable to cover the costs. "In 2014, our budget was 391 million MNT, but it was reduced to 324 million MNT in 2015. Our workload has increased in these last few years, but the budget has decreased. We aren't able to address these disposal issues and other finer matters because we are more concerned with making do with what we have on a daily basis," said Enkhbayar. According to the director of the hospital, the poor financial management system has "truly crippled" the hospital's operations. "We receive 75 percent of our funding from the Health Insurance Fund, but they give us funding on the principle that we treat patients first, to justify the receiving of funds. We don't want to do this. We want our load to be as light as possible. But we are given financing after we use medicine and supplies for patients. We need to make this more flexible," he argued. The hospital staff also notified MP Ts.Oyungerel about more issues that are related to poor financial structure, such as three patients who had kidney removal surgeries who weren't able to receive proper treatment at their local hospital, the closing of their laboratory, and a broken X-ray machine leaking radiation. Enkhbayar also noted that the cleaning and washing of medical staff and patient clothing and sheets is an issue of concern. "Although we have been given 79 million MNT in laundry equipment, it's not being used because the machines requires much higher voltage than the hospital can provide… We asked the ministry to give this equipment to places that need it so we can get the equipment that we need, but this has not been resolved," Enkhbayar said. As the tour of the hospital continued, what was clearly visible was decades of neglect. The hospital's main infrastructure was built in the Soviet era, in the 1980s, and major changes hadn't been made since. The water treatment system of the hospital had obviously not been used, or visited in many years. Dust, debris, and damp air greeted us at the facilities. The main waste pipe was blocked with thick dried sludge as hard as concrete. A plastic overhead pipe had been set up and held with thin rope across the ceiling. The hospital director informed that the overhead plastic waste pipe fell one time and caused a massive leak. The laundry facility was heavily used but most of the equipment was either broken or poorly patched up. Pediatric, maternal and infections disease ward sheets and clothing had separate washing machines, all made in 1983, but two were broken. The central washing machine was working, but a part of the laundry was being done by hand in two bath tubs filled with bleach. The 79 million MNT washing machine was at the laundry facility, unused. After seeing the issues firsthand, MP Ts.Oyungerel underlined the threat that poor waste management poses to society and the need for addressing the issue immediately. "These waste disposal issues never occurred in Mongolia before because there was no centralization. There were no waste and water treatment plants, there was no collection of waste that turning into biological time bombs. Now it's like every street faces this risk, as well as every hospital and every place that collects waste. If this whole waste management issue isn't addressed through the law, through its entire cycle, this will cause major problems in the future," she concluded. April 7 (infomongolia.com) On April 07, 2015, the official website of the President of Mongolia, www.president.mn, has been commencing to launch an audible version as a part of activities to promote President and his Office. A window with a play button will appear below to each latest issue to make it more accessible to people. Also, the Office IT developers plan to introduce the audio version in English as well. Earlier, in order to promote the official use of the traditional script, the Mongolian traditional script version on the President's website was first launched in 2012 upon an initiative of the President Ts.Elbegdorj. Moreover, the Office of the President requested to register its site domain name in Mongolian Cyrillic, after which the Ерөнхийлөгч.мон was created in May 2014, when the Internet Corporation for Assigned Names and Numbers (ICANN) officially announced that preparations for .мон (mon) and .мн (mn) Mongolian Cyrillic domains had been successfully completed for Mongolian use. April 7 (UB Post) Prime Minister Saikhanbileg addressed the nation on Sunday evening, and focused on the need to turnaround the economy and address the issues causing the current situation in Mongolia. INS has analyzed the speech and the first 100-day track record of the new coalition government. Congratulations to Prime Minister Saikhanbileg and to the President and Mr. Tsagaan who have spoken of the hardships and lessons learned over the past three years, and the need to do things differently moving forward. This theme was amplified at Mongolia Economic Forum last week. Instead of blaming the world, they have put the focus onto the accountability and responsibility of Mongolia's leadership. Most importantly the PM is indicating that Mongolia's greatest modern day economic triumph, and ironically, the source of Mongolia's biggest FDI dispute, is likely to have it's second phase restarted shortly. This will see nearly six billion USD invested over five years and OT revenues into the country triple when the richer underground moves into production. For those who continue to question the fairness of the investment agreement, an interesting fact is that the government share of free cash-flow from 2010 to 2021 will equate to almost 80 percent – and well over three billion USD in taxes and royalties alone. This is for zero cash outlay, with all cash inflows provided by the foreign investor. And these returns to the government do not count the multiplier effect on the economy, employment, secondary business development, and additional taxes. The misleading debates over cost overruns and long-term returns to the country need to stop, but why? Because what Mongolia has enjoyed for the past two years is 100 percent of nothing, plus damage to its international reputation as a safe and reliable place for investment. The PM has stated that his focus is all about the economy, and his speech on Sunday evening reinforced the essential need to put a growth-focused base under the economy. He emphasised the need to reignite the confidence and positivity of all Mongolians and foreign investors alike. Missing from the PM's speech was the need to reduce subsidies to building companies and to look at measures that do not create another price bubble. The disparity between housing prices and incomes needs to be closed, and it is clear that the real estate market needs to self-correct. The drive to formalize a savings pool through development of a pension scheme makes sense, especially if this is directed back into new and focused real estate development. Better buildings in better locations with better social services and thoughtful traffic planning are critically needed. UB already has too many skyscrapers without living space, services and year round parking. INS has been clear and consistent in a call for government to exit business and to support the business sector to grow the economy. The government is best placed to provide educational, social, and essential services – but even today there is a growing and successful trend to outsource this to public-private partnerships and the private sector. The PM has emphasized some important privatization decisions around the MSE, MIAT and putting Mongolia's state owned enterprises (SOE) under a Temasek structure. INS strongly recommends the full privatization of loss making business, and that a Temasek-type structure should focus on investing in companies but not operating them. Getting the existing suite of SOE assets into better shape for privatization should be one urgent focus of Mr. Byambasaikhan, the new CEO of Erdenes Mongol. The GoM should finish its love affair with strategic mineral deposits. It should encourage competent and responsible mining companies to do the exploration, development studies, and ultimately, to fund, construct and operate them. The government has been blind-sided on OT and TT for far too long, and it cannot afford to be so distracted in the future. Mongolia definitely needs a "solution for UB pollution" and has the resources and ability to become energy self-sufficient, and possibly a net exporter. Remember, this will only happen if China is prepared to receive power across the border at a price sufficient to underwrite the power station investment inside Mongolia. Having the most cost (and environmentally) effective plants is essential to turn this into profitable business and for Mongolia to make use of its lower quality coal resources. There are at least four coal to liquid project promoters in Mongolia, but these projects are technically complex and globally tend to have marginal economics. The government cannot afford to subsidize another loss-making venture and needs to be careful. Of course, the long term solution to UB's pollution is modern power and heat plants servicing well laid out suburbs in the UB region. This is a long term issue but also a great economic opportunity. The ger districts need to be transformed into a new way of people living together, that is sustainable and attractive for the families and businesses that will reside there. Importantly, Mongolia must upgrade its country-wide power generating capacity, plus invest heavily into the transmission network for both domestic usage and exporting to China. Of critical importance is the need for the government to increase its tax base, and this will occur as it brings more people and enterprises into the formal economy. As real wages increase, a share of that increase will be captured as tax and should be reinvested in essential infrastructure. While the tax base remains small, it is important that the government exercise restraint on pensions and salaries for public servants. Downsizing public service is one way of increasing productivity while allowing an increase in salaries without an increase in the salary bill. The PM has focused on exploration – which can be a driver of long term economic growth – but only if the exploration results in new mines being built. This takes time, expertise, lots of money injected into development work, and inevitably, many failures along the way. The PM has rightfully looked at a new royalty tax-sharing regime with the "mine-hosting aimags and soums". This is innovative and practiced in several progressive countries. INS suggests the PM seek independent review on what is currently happening, as the current arrangements appear very loose and are more likely to lead to development of a secondary market in trading licenses. What is really needed is to attract expert and financially capable players. It would be very interesting to know who the 130 licenses have been issued to – but MRAM is not publishing this information, and it is difficult to trace company ownership in Mongolia to individuals. Of course the parliament will review and comment on the PM's plans, and let us hope the MPs act together to support the recovery and growth agenda. Let us also hope that the forthcoming election period will see the political parties campaign on the basis of economic discipline and playing to Mongolia's strategic strengths. Resorting to populist scare campaigns is not compatible with the emergency agenda facing Mongolia today. April 7 (UB Post) One of Mongolia's favorite subjects for debate is building its own oil refinery. When it comes down to the business of making that dream a reality, problems, such as location, always come up. Whenever there is talk of building an oil refinery, everyone calls for "doing it quickly", but ends up saying the same line over and over again: "We do not have the capacity to build a factory of this caliber." Needless to say, there are many who strive to export crude oil, or to have foreigners do it for them. Some are even willing to submit to countries wishing to use Mongolia's weaknesses to their advantage. It is commonly believed that only when a country has steel and oil refineries, can it be considered a country. Mongolia typically maintains thirty days of oil reserves, but the U.S. has 500 million barrels (about 100 days), Japan has a reserve of 90 days, while OPEC countries generally have reserves of 80 to 120 days. China has a reserve deficit, but they continue to increase the oil barrels annually. Each of these countries operates refineries and maintains oil reserves in case of emergency situations and wartime, while Mongolia is concerned with only filling their tanks. Countries with crude oil should not sit around so pitifully. Mongolia has the capacity to continuously feed oil to refineries and create reserves; that's how much oil we have. There are 30 possible oil extraction locations in Mongolia. In 2012, 490,000 tons of oil were extracted and exported, while 686,000 tons was extracted in 2013, and over 800,000 tons was extracted and exported in 2014. Starting next year, the amount will increase to 1.5 million tons, with expected sales of 1 billion USD. There are three extraction locations currently operating nationwide: Zuunbayan, Tamsag-19, and Tamsag-21. These three locations combined have a guaranteed reserve of 332.6 million tons, but they are licensed to extract only 43 million tons. In the last 14 years, Mongolia has extracted and exported 1.9 million tons of oil to China, with calculations leaving the remaining reserve at 41.1 million tons. Mongolia stands in 33rd place among countries with oil reserves, which is an adequate standing for a country that has just recently started extracting oil. Studies show that since Mongolia has started exporting oil, it has become less dependent on resources from Russia. To be exact, the level of dependency fell from 100 percent to 60 percent. Mongolian domestic oil demand is expected to reach 2 to 2.5 million tons in 2020, and extraction levels can be increased to 1.6 million tons starting from 2018. Last year, 1.4 million tons of oil, gas, and fuel were consumed, with 1.2 billion USD paid to Russia, resulting in massive fluctuations in the exchange rate. As we know, the main reason for these fluctuations is the amount of fuel being imported. If Mongolia were to operate its own oil refinery, most of the issues concerning supply and import expenditure could be solved. Researchers calculate that an oil refinery could start fulfilling domestic needs completely in the first two to three years of operation, while the USD exchange rate could drop down to 1,000 MNT by 2020. It is possible to double the amount of national oil reserves, which is crucial to national security. These actions will result in the increase in Mongolia's global influence, furthering the agenda of constructing strategic factories in the future. It was decided that the nation's first oil refinery be built in either Zuunbayan in Sainshand or Tamsag in Dornod, with Zuunbayan being the favorite, because of its low elevation. For a long time, an issue of concern for building an oil refinery was its presumably adverse effects on the environment. With fast-paced development in technology, 70 percent of all oil refineries are eco-friendly and are based on American technology, which uses only a small amount of water. The Ministry of Industry expressed its interest in this technology, and if funding issues are resolved, Mongolia could very well be cutting ribbons to its first oil refinery by 2019. Experienced companies can build a 1.5-2 million ton capacity oil refinery within three years. Under the ARTNeT Initiative on "Gravity Modelling of Behind-the-Border Factors Affecting Trade" launched in 2008, the Economic and Social Commission for Asia and the Pacific (ESCAP), the Asia-Pacific Research and Training Network on Trade (ARTNeT) in collaboration with the Deutsche Gesellschaft fuer Internationale Zusammenarbeit (GlZ) GmbH, and the German Federal Ministry for Economic Cooperation and Development (BMZ), have jointly organized an ARTNeT-GIZ Capacity Building Workshop on Gravity Modelling from 7 to 9 April 2015 in Ulaanbaatar, Mongolia. The 3-days event is dedicated to hands-on training on gravity modelling, including dataset preparation, estimation, interpretation and policy applications. Basic gravity modelling techniques and simulations based on estimated gravity and related equations were covered during the workshop. Ulaanbaatar, April 7 (MONTSAME) The Municipal Department of Tourism held Tuesday a second annual training of English for the police force, in frames of the "Friendly Ulaanbaatar" program. The training gathered 50 police officers who work in Ulaanbaatar's most crowded-by tourists areas. This training aims at ensuring the tourists' security and forming friendly manners and attitude. The previous action included 60 policemen. The Department of Tourism has published all the training materials and Mongolian-English phrase-books for handouts. April 7 (GoGo Mongolia) If one has traveled through the Bogd mountain road, one might have noticed that construction works started at the west side of Sky Resort. It is evident that the huge construction project kick started as big trucks are moving back and forth, huge earth dams are rising and people busily engaged at the work site. We have inquired on which company is operating in the land protected by the State Special Security Department from the sector ministry. -In view of the upcoming ASEM meeting to be held in Ulaanbaatar city the accommodation village is being constructed. The project provisions construction of two storey buildings only and the Ministry issues the licenses for five years with five year extension periods. The environmental impact assessments for the project has been done. The sources say that the developer is MCS Group and the construction site is dedicated to the project to accommodate high level guests at this ASEM Village. In request to give us more detailed informaiton MCS Group declined by stating that the press conference is to be held in very near future on this project. Mongolia is the official host country of the ASEM 2016 which is to be held in Ulaanbaatar city. The last ASEM summit has been hosted by Milan city of Italy in 2014 and high level representatives of 53 countries visited the event involving the delegation of over 5000 guests and participants. Prime Minister Ch.Saikhanbileg is leading the National Council to ensure the preparation for this even. · initial steps for the formulation of the Energy Work Plan 2016-2020. The meeting was co-chaired by Bayarbat Sangajav, director general for the Finance and Investment Department of the Mongolia Ministry of Energy; Cleo Kawawaki of the Energy Division, Central and West Asia Department, Asian Development Bank; and Sunil Kumar Khosla, lead energy specialist, World Bank. The EWP is built on the foundation of the Energy Action Plan Framework, which has addressed a number of issues in the areas of regional energy demand-supply balance and infrastructure, regional dispatch and regulatory development, and energy-water linkages. The EWP focuses on six key elements: (i) developing the Central Asia-South Asia Energy Corridor, (ii) resolving regional energy dispatch and trade issues, (iii) managing energy-water linkages, (iv) mobilizing funds to build energy assets, (v) implementing energy priority projects, and (vi) building capacity and managing knowledge. Ulaanbaatar, April 7 (MONTSAME) Final planning meeting for the "Khaan Quest-2015" international peace-promoting field exercises is being held at the General Headquarters of Mongolian Armed Forces. Defense representatives of the USA, Canada, the Czech Republic, China, Thailand, Tajikistan, Hungary, South Korea and Japan are attending the meeting. This year's exercises will widen in terms of participation, adding military units from China, the Czech Republic and Japan. On this, a director of the training center for peace-promoting operations at the General Headquarters Lieutenant-Colonel Bat-Erdene said new exercises have been added to the program, such as Combat water assistance training. "As an engineering assistance operation, the exercises will complete the re-decoration for the 55th special school of Bayanzurkh district. The participants also intend to provide a humanitarian medical assistance for 79th school of the same district," he added. April 5 (CCTV) Mongolia's President has apologized for a neo-Nazi group insulting and humiliating several Chinese tourists, saying extreme national was harmful, and that Mongolia should be a responsible, friendly and open country. April 6 (World Bank Blog) Sometimes insights come from unexpected sources. Ever since returning to Mongolia some months ago I have, naturally, been observing how things have changed since I last lived here in 1990s. Many of the changes are immediately recognizable and even foreigners arriving for the first time could guess that the high-rise buildings and cafes are new. But it was a chance conversation with a fellow foreigner that drove home just how dramatic those changes have been. When I moved to Mongolia in 1993, the first Mongolian word every foreigner learned was baikhgui. Not there; don't have any; absent. With this simple utilitarian word, one could concisely express the verbal equivalent of a shake of the head. "What happened to the water/electricity/heat?" Store shelves were empty and inflation was skyrocketing. Savers saw their savings evaporate, and those with money had little to spend it on. Those lucky enough to have dollars could find some goods at one of a couple "dollar shops", receiving sticks of chewing gum as change. In the early 1990s, Mongolia's transition was about recovering from collapse and building the basic institutions of democracy and capitalism. GDP had fallen more than 20 percent as the former socialist trading arrangements collapsed and Soviet aid was withdrawn. The old tools of administrative control were still being applied—the basic institutions of markets had yet to be developed and officials, trained in Marxist-Leninist economics, had a basic lack of trust that the "chaos of the market" would not make things even worse. While the early 1990s taught foreigners the word baikhgui, by now the operative word has become baigaa; an equally utilitarian word, the verbal equivalent of a nod: We have it; yes, indeed; present. The store shelves had filled long ago—nature abhors a vacuum and suitcase traders filled it—but in the intervening years the numbers of shelves and stores, and the selection of goods available, had grown tremendously. Between 1993 and 2014, Mongolia's average income per person tripled. Signs of change are also apparent in headlines. A stringer for the wire services in the 1990s used to say that the only way he could get stories published was to have either Chinggis Khan or the ratio of animals to people in the first paragraph. Indeed, even some academic authors shamelessly followed this dictum. (Ahem.) Now, however, the foreign press is all about the mines. When will the new deal for OT's second phase be signed? What are the forecasts for copper/coal/gold prices? One thing that hasn't changed is that Mongolia still likes to do things in a big way. One of the more radical reformers in the transition from plans to markets, with an early mass privatization program in the 1990s, Mongolia embraced the mining economy with vigor when vast mineral resources were discovered. Mongolia was not the first country to experience a natural resources boom, and there were lessons aplenty from other countries about how to manage the boom-bust cycles, how to "save for a rainy day" and, hopefully, avoid the resource curse. But the magnitude of the adjustment that Mongolia had to manage is mind boggling. When I lived in Mongolia in the 1990s, foreign direct investment (FDI) averaged 1-2 percent of GDP. Even as late as 2009, FDI was less than 15 percent of GDP. By 2011, as investment in OT and other mines was in full swing, FDI had soared to 53.6 percent of GDP. By 2011 the economy was growing at 17 percent, and the notion of a boom-bust cycle was entertained only by pessimists; and, as it turns out, realists. And while the first case of "Dutch Disease" afflicted a relatively prosperous country, a country with strong market institutions, Mongolia was neither. For a young democracy with young institutions, with the suffering of the depression of the 1990s still within memory, and with a citizenry eager for better days, the idea of countercyclical policies, of saving for a "rainy day", found little support. Then the bust part of the cycle kicked in. As quickly it ascended to the heavens, FDI fell back down to Earth as OT moved from development to operations and policy changes led some foreign investors to lose confidence—FDI as a share of GDP stood at 7.2% at the end of 2014. Commodity prices fell (and look to continue falling), growth has slowed, and the repayments of foreign borrowings loom only two years away. Now that there is a downpour, the "rainy day" fund is in deficit. April 7 (UB Post) Heavy snowfall and blizzard left 98 people lost, 140 cars and more households covered in snow, and numerous livestock dead nationwide last week. A total of 98 people were reported missing in Arkhangai, Dundgovi, Uvurkhangai, Tuv, Uvs and Bulgan Provinces. From them, 96 were found safe while one was found dead and one is still missing. Dundgovi Province Police reported that the last missing person to be found is a 50-year-old herder of Erdenedalai soum, who was reported missing during a blizzard while herding. He was found far from his home in another soum, Luus. The herder said he found a winter quarter of another herder and took shelter until the blizzard died. Tsenkhermandal soum of Khentii Province is still scouring to find the last missing person, who is reportedly a 55-year-old man from Baganuur District and went missing in the soum when he was driving during the blizzard. A team of 27 rescuers are searching for the man, with four vehicles. The man's car was found in Tsenhermandal soum on Saturday. A 26-year-old man who was reported missing after leaving home on Sunday in Ulziit soum, Uvurkhangai Province was found dead after the blizzard. A rescue team found his body below an accumulated snow after searching for him on the following day. Many roads in provinces and near Ulaanbaatar have been blocked by snow, leaving around 140 vehicles with 750 people stuck on the road. The vehicles managed to arrive at their destination without the help of the National Emergency Management Agency rescue teams and neighborhood residents. A group of five members of the Mongolian Land Cruiser Club voluntarily headed from Ulaanbaatar to Arkhangai road close to the city and rescued people in 11 cars. One of the rescued was D.Mainbayar, director of Motort Khulgiin Master LLC. He reported that the passengers in the stuck cars were close to freezing when the rescuers arrived. Traffic between provinces and Ulaanbaatar were halted temporarily from 10:00 a.m. Sunday to 07:30 a.m. Monday to prevent traffic accidents and blocked cars. The blizzard cut power in four soums in Bulgan Province. Uvs Province had the worst time during the blizzard according to province heads. D.Ulziit, acting chief of Uvs Province Emergency Management Agency, reported, "Two working groups are giving logs and hay to herders blocked in snow, while another group is clearing accumulated snow from roads to open up traffic. Several livestock died in our province, but we haven't set the number yet." Road cleaning works are lagging behind in Uvs Province and the acting chief explained, "We don't have enough workers for snow clearing, and the snow amount is very high. Accumulated snow reached one meter in height in the areas affected by the blizzard, while average snow height in the province is 30 centimeters now." A total of 91 households have been blocked by snow since Friday in mountainous regions of Uvs Province. "Two snow plows are working to make a drive path to reach those households in three soums. It is impossible to drive trucks to them. Livestock of the blocked households are in a very dangerous condition as they haven't grazed for five days," added D.Ulziit. The traffic accident rate has risen three folds since the heavy snow fall on Friday and Saturday in Ulaanbaatar, reported the General Traffic Police Department. Central roads have seen three to nine-car collisions near the Mongolian National Broadcaster, in 3rd micro-district and in 13th micro-district. No major injuries related to the collisions were reported. Public servants are still clearing ice and snow from roads and sidewalks. April 7 (gogo.mn) Freestyle Wrestling tournament as it serves as the first qualifying event for the 2016 Olympic Games in Rio de Janeiro, Brazil is to be hosted in Mongolia. President of Mongolian Freestyle Wrestling Association, D.Dagvadorj announced this delighted news. The official right to organize the qualifying tournament which will take place in Ulaanbaatar city from 22th of April to 24th of April, 2015, was given by World Wrestling Association. To compete at qualifying tournament both for female and male teams at their native country is the biggest advantage to us.